As children, we were fascinated by seemingly everyday objects that turned out to be magic. The heroes of fairytales, legends, and myths would routinely surmount the difficulties they faced with the help of some magic item whose hidden powers defied the laws of nature. In modern popular culture this motif is perhaps best embodied in Disney films where inanimate objects become sentient beings who come to the aid of the main character. The prime exponent might be the brooms in the “Sorcerer’s Apprentice” sequence in Fantasia, which sweep the floor all on their own; other examples that spring to mind are the magic mirror in Snow White or the talking candlesticks, clocks, and teacups in Beauty and the Beast. “Any sufficiently advanced technology is indistinguishable from magic.” Arthur C. Clarke’s widely quoted proposition seems particularly apt in this context. What in an earlier age we would have culturally construed as magic is now a reality—designed, planned, documented, and operated by technologists around the world. Our magic brooms are home-cleaning robots; our magic mirrors are smartphones, equipped with Internet search engines that work much like all-knowing oracles, answering our questions out loud in an ersatz human voice. The value of our home appliances increasingly lies in their embedded electronics and software, enabling them to engage in a rich range of behaviors that earns them the qualifier smart. The term Internet of Things was proposed by Kevin Ashton in 1999 in a presentation in which he argued that by associating physical objects with RFID labels we can give each object an identity enabling it to generate data about itself and its perceptions and publish that information on the Internet. What was new about this insight was that so far the information available on the Internet had been produced almost exclusively by people (news, articles, commentaries) or by computerized systems (flight information, stock prices), not by actual physical things. The idea of the Internet of Things is that the things around us—home appliances, vehicles, clothes, soft drink cans, even the street bench where I am now tapping out these words—should become first-class Internet citizens, producing and consuming information generated by other things, by people, or by other systems. Every technological advance should move humankind forward in some way. So what can the Internet of Things do for us humans? How can things connected to the Internet make our lives happier, better, or longer? In this discussion I shall return several times to a simple example targeted by any number of research projects: the smart chair. A smart chair looks like—and is—an ordinary chair, but the back and seat conceal a set of small sensors that continually track the user’s posture. Then a wireless module sends the posture data to a set of servers, where the data is stored and analyzed for patterns that tell us whether or not the sitter has good posture, spends too long in the same position, or doesn’t take enough breaks. This information can help the user of the smart chair to improve her posture and relieve her back trouble. Some smart chairs vibrate when they detect an unhealthy way of sitting, prompting the user to learn and adopt good posture in an almost unconscious way. The key take-away of this example is that the value proposition of the chair has crucially shifted: it is no longer just an item of furniture; it is a medical device designed to prevent lower back pain. And this may be the most promising feature of the Internet of Things— its ability to create a new, different, and enhanced value proposition by providing conventional objects with Internet connectivity and data processing power in the cloud. The Internet of Things makes things smart. The horizons that open up to us are as wide as they are new and unheard of. When conventional physical objects get Internet access, what kind of hybrids can we expect to see? Entirely new economic flows could emerge. A manufacturer might give away a smart chair for free because it has based its business model on the monthly fees for back health monitoring, shifting from sale of goods to service subscription. How can smart, all-knowing things help people? Although the idea of magic objects has existed in human culture since antiquity, it is no happenstance that it is only now when they are beginning to be real. There are three main reasons for this: electronic parts have become smaller and cheaper; the world is interconnected by communications; and people have adopted a digital lifestyle. The lower price of the electronics needed to connect an object to the Internet and endow it with a new value proposition has made it profitable to produce such goods, while the smaller size of the components have made it feasible to hide them within the product so that the user does not perceive it as bulky. Popular clothing labels now sell products that let you monitor your running performance using a tiny electronic device under the sole of your running shoe—later on, you can view your stats using a smartphone app. But it is cost reduction and miniaturization that have made this possible. Global connectivity—over the Wi-Fi networks that are now ubiquitous in the developed world, or over 2G, 3G, or 4G mobile networks—allows objects connected to the Internet to keep in touch with the associated services that make them smart. For example, Ambient Umbrella, a web-connected umbrella designed in 2007, would connect with weather forecasting servers to find out if it would be useful in the next few hours—if so, it would subtly alert the user by emitting a halo of light. Finally, the digital lifestyle that wraps around every aspect of our existence enables web-connected things to get past the barrier of human resistance to novelty and change—perhaps the greatest obstacle we humans are apt to pose—and gradually to become a part of everyday life. Because we use Internet-driven services every day (online news, social media, e-commerce), we do not resist the notion that some of the objects in our environment also partake of that ecosystem as a way of making life easier for us. Let’s now discuss some of the ways in which the Internet of Things is already at work in society. One of the major achievements of humanity —though perhaps not as widely recognized now as it will be eventually— is Wikipedia. This is a repository of information in more than two hundred languages that has brought knowledge closer to millions of people around the world, including regions that would otherwise never have been able to distribute the information among their communities in such a short space of time. Wikipedia content is written and kept up to date by thousands of users around the world on the basis of the openness and freedom embodied in the Wikipedia tagline —“The free encyclopedia that anyone can edit”— to create the largest repository of knowledge ever known. Let’s now try to visualize how the wiki concept could apply to the Internet of Things in a specific location, such as a city. A WikiCity would be a repository of knowledge about the city whereby the physical objects within it —street furniture, pollution sensors, traffic lights, garbage trucks, green area irrigation systems— would create and update content in keeping with the changes perceived over time. So the “daily pollution level” webpage would be updated continually by pollution and particulate matter sensors at given times of day, in given areas; the “weather information” page would be updated by temperature, wind, sunlight, and rainfall sensors deployed in the city’s parks and gardens. And then both pages would be referred to by traffic control systems to determine the interrelationships between rising pollution levels in a given area, vehicle traffic in that area tracked by sensors embedded in the road surface, and weather data, so as to take traffic planning decisions that improve the quality of life of the community. Some real-life cities have already deployed networks of smart sensors experimentally to create sentient cities that are self-aware and adapt accordingly: the Smart Cities trend. Leading examples include Smart Santander (Spain), Amsterdam Smart City (Netherlands), and Songdo IBD (South Korea). Many of these initiatives are backed by big software and equipment corporations that have chosen to make a strategic bid to develop the value-added services that a connected city can offer to its citizens. “You can’t manage what you don’t measure.” This quotation —variously attributed to the American statistician William Edwards Deming or to Peter F. Drucker, the founder of modern corporate management philosophy— has become one of the most widely followed management adages today. When we have figures and other information about a given phenomenon, and we also have the knowledge and techniques to interpret the data correctly, then we can identify the factors influencing that phenomenon and act upon them to get the desired outcome. Businesses apply this principle all the time, analyzing and crossreferencing the data throughout the value chain —R & D, procurement, manufacturing processes, distribution, and after-sales service— to create products and services that provide the highest possible value at the lowest possible cost. This is made possible by the fact that each of those areas of the value chain has quality management mechanisms in place that collect information continuously for ex post or real-time analysis. What about individual people —can we do the same thing in our everyday lives? Can we track all the data about our daily activities —sleeping, walking, eating, breathing— to analyze our habits? And how can we use the results of our analysis?. In the past decade these questions have become hot topics in the scientific community. And thanks to all-pervasive connectivity and the diminishing size and price of electronics—which we mentioned above—we can now have small spy devices living in our homes or hiding in our clothes to collect data about us which can later be interpreted to provide us with a more accurate picture of the way we live. The Quantified Self trend has emerged in the shape of popular commercial products that exhibit the object/service duality that is the hallmark of the Internet of Things. The trigger is the physical object, which collects data from the user’s environment; the object then sends the data to an online platform, the home of the service, which interprets the information, integrates it with other sources to enhance value, and reports it in userfriendly form. Many recent startups have jumped on the Quantified Self bandwagon to sell wristbands or clips with a built-in accelerometer that you can wear to monitor your level of physical activity. The device detects whether you are standing still, walking, or running. The data captured throughout the day is sent to the related app, which then tells you whether your daily physical activity burns enough calories; in response, you might set yourself goals such as walking to work two days a week or doing more daily exercise to improve your metrics. One of the key signatures of almost all sensor-based webconnected products —like wellness-tracking wristbands— is that they “make the invisible visible,” revealing data which was always there but had never been measured before. The new generation of wearable sensors can be likened to the invention of the microscope: suddenly, a whole new world of information opens up, a new science, where you are the researcher and your own habits and behavior are the subject matter being researched. Other consumer goods in the Quantified Self category include webconnected bathroom scales that let you monitor your diet and set weight-loss goals, sleep trackers that help identify sleep disorders, sports shoes that monitor your performance and suggest ways you can improve, and wearable necklace micro-cameras that take snaps at regular intervals as you go about your daily life so that later on you can remember what you were doing. A particularly good example is a device that displays three of the distinctive features of the Internet of Things. The Air Quality Egg is a personal air-quality sensor that measures pollution levels outside your own home. In addition, you can work together with other Egg users to create maps that track patterns of change in air quality across entire cities. The Air Quality Egg can be classified equally well to the Quantified Self and Smart Cities categories, but it has a third trait that makes it all the more interesting —it gives users a way to work together as a community, and this makes their information more valuable. The overlap of the Internet of Things with Big Data (data captured on an ongoing basis in such vast quantities and to such a degree of complexity that it resists conventional analysis techniques) and Open Data (open, public data available for analysis by anyone) is encouraging the rise of a new generation of analytics services capable of finding counterintuitive interrelationships among factors which seemed to have nothing to do with each other. We are still seeing constant forward movement in technology, but telecommunications and electronic smart devices carry an energy cost, which rises in proportion to how smart and how communicative the given device is—these being the two key benefits of our enchanted objects. Electrical cells with higher capacity per unit of volume, low-powered microprocessors, and energy-efficient Wi-Fi modules form the landscape of today’s research battleground where the question will be answered of which future product line users will adopt. Some smart devices, particularly wearable and outdoor ones, can harvest enough energy in a natural way from their environment to keep functioning self-sufficiently for long periods. The most widespread examples are environmental sensors in cities and wooded areas that generate solar power using photovoltaic cells. More striking, however, are wearable devices —sports shoes and equipment, for instance— that can draw off the energy that accumulates in the materials themselves as a result of movement and flexion while being used. These small quantities of energy can be sufficient to extend the device’s energy life to a significant degree; paradoxically, the more you use the product, the less you need to recharge it and the better it works. On June 18, 2009, the European Commission released a document entitled Internet of Things: An Action Plan for Europe. This ten-page report contains a brief discussion of the strategic opportunity proffered by connected products to improve the quality of life of European citizens and support industrial development. Yet what caught media attention was that the Commission set out some interesting and novel ideas about the role of government authorities in a highly sensorized world. That objects everywhere are connected to the Internet is a fact that should obviously give us pause. Could a cyber terrorist have a field day with webconnected utilities, vehicles, and home appliances? Here, it would not just be information we would lose; physical assets and systems would be destroyed. Who controls and who is entitled to access all the information about individuals captured by sensors throughout our cities and homes? What should be the new ethical and legal frameworks governing the interrelationships among people, connected objects, and their related services? The so-called right to the silence of the chips expresses the idea that an individual is entitled to disconnect, and to have sensor networks stop capturing and monitoring his or her activities. National security naturally demands a certain minimum level of supervision to exist. However, the gist of the commission’s paper is that there will come a point when we are monitored by so many objects that we may not even be aware of them in a way which enables us to exercise our rights properly. Take the example of an apparently harmless product, such as a webconnected television set. It is obviously a good product to have, because we can access virtually unlimited content created in real time anywhere in the world. But what you may not realize is that your TV usage data —what you are watching, in what time frames, how often— is stored on the online platform and can be used to build up a user profile of your behavior patterns, your entertainment preferences, and even your political orientation. All this is very personal information about you. A kitchen robot that is connected to the Internet to download firmware updates and meal plans can capture usage data capable of supporting inferences about how many people live in your home, what sort of food you like to eat, and the heart disease risk associated with it—which might eventually be used as grounds to raise your life insurance premium. So we have characterized some of the commercial products within the Internet of Things paradigm as silent spies that track everything we do. The upside is that they can uncover hidden data, “make the invisible visible,” and help us acquire knowledge about our environment and ourselves. The downside is that because these devices capture highly personal information —which can be cross-referenced to other data about you already available via social media— it is necessary to take rigorous steps and urgently pass laws to protect individuals’ privacy and give them full and effective rights to decide what happens to that information. Another trend that is driving new concepts and exploration in the Internet of Things framework is a corollary of the rise of highly accessible and easily learned development platforms that do not require technical qualifications or months of training for a layperson to create his or her own connected objects. The most popular such platform is Arduino, created in 2005 by a team headed by Massimo Banzi and David Cuartielles at the Interaction Design Institute Ivrea, Italy. Because it is cheap—the basic version is priced at around 20 euros—and easy to program and use, Arduino quickly attracted interaction designers, artists, and hobbyists, who found that experimenting with this platform was more fun and easier to learn, and led to quicker prototyping cycles. The effect of open-source platforms in fostering the rise of communities of developers sharing expertise and resources was already well understood and widely applied in the arena of software; but Arduino was the first mass platform to do the same for hardware, inaugurating the movement known as Open-Source Hardware. The openness and the specific architecture of Arduino encourage the emergence of new variants of itself, as well as add-ons and accessories —called shields— that let you quickly make fully functioning gadget prototypes by just fitting different parts together as if you were playing with a Lego set. And, as we know, since the Internet is the largest existing source of data and services, it is a natural assumption that many of the available shields are designed to provide Bluetooth, Ethernet, Wi-Fi, 2G, or 3G connectivity for Arduino. So creating a physical object that captures environmental data and uploads it to online servers, or, in the opposite direction, that pulls down data from the net to affect the user’s physical environment by means of light halos, sound, or movement, turns out to be quite easy to do even by people with no electronics expertise, including teenagers and children. Arduino and similar web-connected quick prototyping platforms have proved a special boon for product designers and artists. Now, for the first time, they can cheaply produce a physical embodiment of a concept, whereas before they could only picture it in their minds. Bubblino is a bubble- blowing robot that looks out for a certain keyword on Twitter and blows a bubble every time someone uses that word. GoodNightLamp comprises two or more paired lamps that keep people who live in different places in touch with another by lighting up at the same time, thus strengthening their emotional bond. reaDIYmate consists of connected animated paper figures and sculptures that move in whichever way you have chosen in response to online events, such as incoming e-mail or stock price movements. iSouvenir is a souvenir 2.0 created by me, the author of this article; it lights up and buzzes every time somebody on social media says they are at the place or heritage site depicted by the souvenir, thus imbuing a traditional object with a sort of global sentience. The democratizing of technology surrounding the creation of webconnected concepts has been powerfully nurtured by the maker movement. DIY or do-it-yourself is a decades-old movement that advocates the idea that you should make or repair goods on your own initiative, not just to save money, but also —and mainly— to learn how they work and so acquire the ability to design your own personal variants, with features not provided by commercial versions. The maker movement is a DIY variant that adopts technology to create personalized objects boasting electronic smarts and, a lot of the time, Internet connectivity. Low-cost, quick prototyping platforms —like the aforementioned Arduino— are one way of pursuing this hobby. Many users proudly upload to the Internet accounts of the various steps they took to create their home temperature and humidity monitoring system, or their lamp that lights up in different colors depending on weather forecasts provided by an Internet server. Makers are interesting because their hobby is based on user communities that, again, freely share their expertise, experiment with sharply innovative ideas and product concepts that appeal to specific niches, and even produce commercial variants of their inventions—which benefits the local economy. The maker ethic is pretty much the opposite of massive corporate investment in manufacturing spitting out huge series of industrialized goods; what makers do is create personalized, almost handcrafted technological products for customer niches outside the scope of the conventional market. As the examples in the earlier sections have shown, the Internet of Things paradigm poses some challenges, but also a world of opportunity, for new enterprises and business models. Beyond RFID and NFC (Near Field Communication) tags —the earliest implementations of the Internet of Things—these opportunities are inherent in the object/service duality that is the hallmark of web-connected products. To return to the example of the smart chair, a smart chair manufacturer could be seen as moving on from “manufacturing and selling chairs” to “selling a lower back wellness monitoring service,” the service being triggered by the chair, which could be hired or financed while the user’s subscription is active. The shift in the value proposition, in relations with customers, and in the way the offering is communicated is immense—so much so, that the business becomes something completely different. This strategy has already been used in conventional contexts—mobile phones partly or wholly financed by fixed service contracts, cable TV subscriptions inclusive of converter box rental, and, more recently, arrangements whereby some of the recurring income from mid- and highend cars comes from monthly fees for vehicle information and monitoring by the manufacturer. Web-connected devices are an ideal setting for servification—the process of shifting the value proposition from the physical object to the online service. The key advantage of this approach is that, although the physical object usually cannot be modified once it is in the consumer’s hands, its related online services can be adapted and improved at any time. This extends the lifetime of the product (defined as the whole object/service package) and raises the value perceived by the user, who witnesses how the product is accommodated to his or her needs and accordingly views it as smarter. To return to our earlier example of the smart chair, the manufacturer could offer, with reference to one and the same physical object —the chair— several different service levels of lower back monitoring at different rates: the customer might be a home office user, or a small or medium-sized enterprise, or a large corporation that might want to generate anonymized detailed reports that are sent to the occupational risk prevention department and employees themselves so that they can take corrective action. By building up a mass of data, the manufacturer —or service provider— can obtain usage metrics for each user type so as to identify where the value is for each customer and adapt its service range and pricing plans accordingly without having to modify the physical chair: only the analytics and reporting services provided from its servers need to be reprogrammed. The servification process involves two key benefits. First, the provider obtains ongoing metrics characterizing the way that customers use the service. In a conventional setting, once the chair reaches the purchaser, the way it is used is traceable only in the form of customer surveys, or complaints about specific problems with given batches. But now the object is being monitored all the time and the manufacturer has a lot more information to work with. To take another example, a manufacturer of ovens could obtain anonymized data on oven usage—rewarding users for the data with gifts and prize drawings, for instance—and so gain a better understanding of how its products are used by various population groups (young couples, families with children, geographical differences, and so on). This information can then serve as the basis for developing new, specifically targeted ovens with more accurate pricing that reflects the functionalities that contribute value to the given market segment. Secondly, because most of the product’s smarts are in the cloud and, like any other Internet-based service, can be readily altered and adapted without need of involving the user directly, the product can be evolved through far quicker iteration cycles. For the smart chair, for instance, new premium reports could be developed for users willing to pay more for specific kinds of data. Iteration cycles for developing new services associated with the product can be rolled out in a matter of weeks or months and entail little cost—they are much quicker and cheaper than development cycles for the physical component. There is no one market for the Internet of Things; rather, the paradigm is applicable to a wide swath of sectors and markets, embracing logistics and transport management, connected furniture and appliances, agricultural monitoring systems, smart clothes and accessories, toys, entertainment, and art. Predictions range from 20 to 50 billion products being connected to the Internet by the end of this decade. All of them based on the object/service duality. All of them designed to make life easier for us. In 1874 a team of French engineers built a system of sensors allowing for remote monitoring from Paris of weather and snow depth conditions on Mont Blanc. In 2013, you can use your smartphone to estimate the calories you burned over the past hour of running or cycling. Next, you get in your car, which will suggest the best route to take based on traffic density and the cheapest service stations on the way. While driving, you can give voice commands to your refrigerator so that it produces an inventory and suggests balanced, healthy recipes you can cook today using the available ingredients. Twenty minutes in advance of your arrival, the central heating in your home is triggered remotely. These two scenarios are separated by an interval of more than hundred years and several technological revolutions. All the products mentioned in this article as examples are, or are about to be, a reality, although many of them have not yet been adopted on a mass scale or integrated with one another. We are witnessing only the early stages in the history of smart web-connected products. Many challenges lie ahead—security and privacy, product energy and maintenance needs, new product/person relationship models leading to product/user/manufacturer relationships, and new business models reflecting the object/service duality. The magic of enchanted objects is finally becoming a reality. Enchanted objects are here. They are here to stay. And they are here to help us, opening up fascinating new horizons. Evans, Dave. 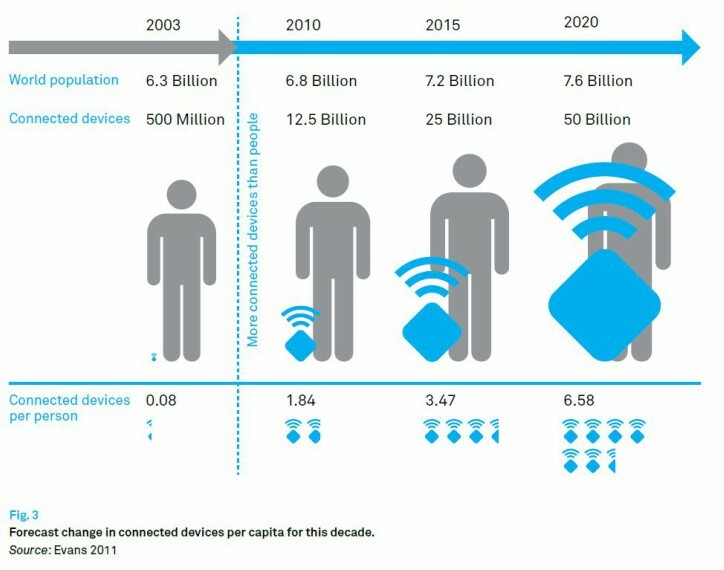 “The Internet of Things: How the Next Evolution of the Internet Is Changing Everything.” Cisco White Paper, April 2011. Gruman, Galen, Scott Bauer, and Vinod Baya. 2013. “Using Technology to Help Customers Achieve Their Goals.” In “Internet of Things: Evolving Transactions into Relationships,” PWC Technology Forecast, no. 1 (2013). Harbor Research. “Shared Destinies: How The Internet of Things, Social Networks & Creative Collaboration Will Shape Future Market Structure.” White Paper, 2009. Nold, Christian, and Rob van Kranenburg. The Internet of People for a Post-Oil World. Situated Technologies Pamphlets 8. Journal of Sensor and Actuator Networks 1, no 3 (2012): 217–53. Van Kranenburg, Rob. The Internet of Things. A Critique of Ambient Technology and the All-Seeing Network of RFID. Vázquez, Juan Ignacio, and Diego López-de-Ipiña. “Social Devices: Autonomous Artifacts That Communicate on the Internet.” In Christian Floerkemeier, Sanjay E. Sarma, Marc Langheinrich, Friedemann Mattern, and Elgar Fleisch, eds. The Internet of Things: First International Conference, IOT 2008, Zurich, Switzerland, March 26–28, 2008, Proceedings. Berlin and Heidelberg: Springer Verlag, 2008. 308–24. Vázquez, Juan Ignacio, Jonathan Ruiz-de-Garibay, Xabier Eguiluz, Iker Doamo, Silvia Rentería, and Ana Ayerbe. “Communication Architectures and Experiences for Web-Connected Physical Smart Objects.” Pervasive Computing and Communications Workshops (PERCOM Workshops), 8th IEEE International Conference on March 29 –April 2, 2010. Mannheim, Germany: IEEE Explore, 2010. 684–89. Vázquez, Juan Ignacio. “Exploring Business Models for Web-Connected Consumer Products.” Presentation, Third Annual Internet of Things Europe 2011: Bridging the Divide between Policy and Reality, Brussels, June 28/29, 2011. Vázquez, Juan Ignacio. "The Internet of Things: Outlook and Challenges." In Ch@nge: 19 Key Essays on How the Internet Is Changing Our Lives. Madrid: BBVA, 2013.